Best Late Stage Investment of the Year: Tendril Networks, Inc.
“NREL’s Clean Energy Forum Attracts National Investment Community” is the official press release from the 21st NREL Industry Growth Forum of the U.S. Department of Energy’s National Renewable Energy Laboratory. Presented by President and CEO Steve Hane, Ampulse Corporation is developing Film-Silicon Photovoltaic (PV) solar cell technology to integrate the benefits of high efficiency crystalline silicon (c-Si) with the lower cost of Thin Film PV. Ampulse’s Film-Si technology uses Hot-Wire Chemical Vapor Deposition (HWCVD) to deposit Si from Silane gas onto RABiTs (rolling-assisted, biaxially textured substrates). Per the Oak Ridge National Laboratory (ORNL) definition targeting grid transmissions cables: RABiTS are special templates that enable superconducting materials to carry unprecedented amounts of electric current compared to conventional copper or aluminum wires. “Hunting for Cash at the Cleantech Forum” by Rachel Barron at Greentech Media also discusses the Ampulse presentation, “Film-Silicon PV: The Next Generation in Solar Technology”, at the earlier September 2008 CLEANTECH FORUM XVIII in Washington, D.C.
Ampulse, which is in the earliest stage of the three companies, operating as a “virtual company” out of the IVP office in Knoxville, with Kline as acting CEO, received $1 million in pre-seed funding, he said. In May 2008, Ampulse added NREL to the ORNL collaborative research partnership through a $500,000 cooperative research and development agreement (CRADA), “NREL Commercialization Project Accelerates PV Technology Innovation”, supported by the Department of Energy’s Technology Commercialization Development Fund (TCDF) Program. Per the Cleantech Forum presentation, Ampulse intends to raise $10 million in Series A funding by June 2009 to develop a pilot line and begin generating revenue. A follow on $50 million Series B funding round will be required to achieve commercial revenue scale by scaling manufacturing partners using a capital efficient contract manufacturing production model targeting semiconductor firms with excess capacity. The Growth Forum final agenda has the complete list of presenters and business segment. Company presentations should be posted within a few weeks of the event. Optony, Inc., Thin film Concentrating Solar, Presenter: PR Yu. Please see “NREL and Optony Collaborate on Developing Cost-Competitive Approach for Solar Electricity” or “Optony: Where Thin Film and Concentrating Solar Meet” by Katie Fehrenbacher at Earth2Tech. Solar Red, PV Balance of System, Presenter: Joe Augenbraun. Solar Red is a California Clean Tech Open (CCTO), now known as the Clean Tech Open (CTO), 2008 Green Building Finalist claiming to dramatically lower the cost of residential PV. I remember Mr. Augenbraun as Commodore-Amiga alumni. Photon Synergy, Nano Engineered PV, Presenter: Xiaoming He. I am wondering if this company’s technology has something to do with “Silicon Nanocrystals for Superefficient Solar Cells”? Ahura Energy Inc., Solar Thermal Concentrator, Presenter: Fareed Sepehry-Fard. Perhaps this is a hybrid/combined approach? Mr. Sepehry-Fard holds patents related to multijunction solar cells although a deposition patent was placed on the block by Ocean Tomo Auctions earlier this year. MicroLink Devices, PV, Presenter: David McCallum. MicroLink Devices is developing high efficiency, III-V inverted dual junction solar cells for terrestrial High Concentration PhotoVoltaic (HCPV) applications. 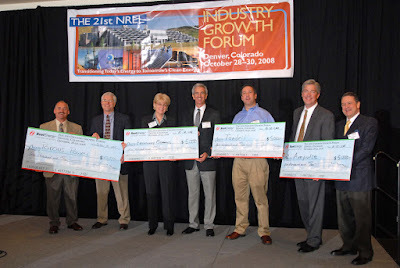 All the winners at the 21st NREL Industry Growth Forum are Colorado companies as amplified by this press release from Colorado Governor John Ritter, “GOV. RITTER CONGRATULATES COLORADO NEW ENERGY ECONOMY COMPANIES”. I have suspected a location bias to the Growth Forum, but this appears to be a new extreme. Or do clean and green companies prefer Colorado locations just to leverage relationships with NREL? This is a clean language Blog, but WTF! Inherently safe, the HPM utilizes the energy of low-enriched uranium fuel and will be licensed by the U.S. Nuclear Regulatory Commission. Each unit produces 70 megawatts of thermal energy, or 27 megawatts of electricity when connected to a steam turbine. OK, there may be applications for the HPM, but I don’t want one on my deck or in my backyard.